In our contemporary ‘publish or perish’ culture, postgraduate researchers find themselves under pressure to gain publication before they complete their thesis. In an increasingly inhospitable job market, it has become extremely difficult to find academic work post-PhD without one or more peer-reviewed academic papers. Then there’s the pressure to gain teaching experience, as well as the mundane though often challenging business of supporting yourself financially in an environment where postgraduate funding is becoming ever more difficult to obtain. In these conditions surely academic blogging is a distraction from more pressing concerns? Even if you see the multiplicity of benefits it can offer to postgraduate researchers, it might still seem as if it simply takes up too much time. The vast majority of popular political blogs are now multi-author blogs (MABs); that is, themed and coherent blogs run by a proper editorial team and calling on the services of multiple authors to ensure that the blog remains topical, can accumulate a great deal of content and can ensure a good ‘churn’ of high quality posts. We believe that MABs are a very important development, and they can be an assured way for an academic institution to become more effective in the context of the web. The rapid success of the British Politics and Policy @ LSE blog is a case in point. Set up originally as a temporary experiment to cover the 2010 General Election, we have now posted over 800 blogs from over 250 different authors.The blog has become a means by which LSE seeks to reach out to people from other institutions and universities in the UK and abroad. Our contributors include politicians and journalists as well as members of think tanks, NGOs and the wider academic community. On a purely pragmatic level, MABs are much easier to sustain than single author blogs. They also tend to be more successful. With a diverse range of contributors, a successful editorial policy and a clear sense of purpose, the ensuing blog will be accessible and engaging. Likewise with an associated Twitter account and Facebook page, updating followers when new content is published, readership communities can emerge around MABs. Maintaining such a blog can be a very different process to having a single-author blog (see the ‘collaborative online’ case studies from the Knowledge Centre for some practical examples of this) but it can also be more rewarding both personally and professionally. It’s something all postgraduate researchers should consider, particularly if you already know a few people with similar interests who are exploring academic blogging. Follow this post to find out how to register! So how do you go about becoming an academic blogger? Firstly you need to decide what kind of blogger you are. What do you want to achieve through blogging? In answering this question it can help to get a sense of other people at Warwick who blog and what they get out of it. Do you want a place to publish your work online? Do you want to practice your writing? Do you want an online presence for a project you’re involved in? Do you want to disseminate your research? Do you want to setup a collaborative writing/publishing project? Do you want to connect with other researchers? Do you want to gain a wider perspective on your field? These are just some of the things that motivate postgraduate researchers to get started. It’s not necessary to know exactly why you want to start blogging. Most people find that their interest in it changes (and grows!) over time. Nonetheless it’s a good idea to think about what you might like to achieve as a postgraduate researcher through starting a blog. This also shapes how you blog: what service you use and the style you adopt in your writing e.g. if you’re writing to connect with other researchers in your area then technical terminology is more acceptable than if you’re writing for a broad audience. If you just want an online scrapbook to post thoughts, ideas, quotes and multimedia then use Tumblr. It also suits if your blog is going to be more personal than professional - though it’s worth pointing out that for postgraduate researchers in particular, as well as bloggers in general, the two categories can sometimes get blurred. If you want a place to practice your writing, connect with other researchers at Warwick or act as an online presence for a Warwick based projects then use Warwick Blogs. The fact it’s branded and shows up prominently in search engines makes it very useful for these purposes. It’s also good if you’re not feeling particularly confident about the process. If you want to setup a collaborative writing project then use Wordpress. Though the amount of functionality can be confusing at first, it has very powerful tools to facilitate multi-author projects and extending the functionality by moving it to a private hosting service. To complete thing 1 create a blog using one of the platforms listed above. This blog will be used to track your progress on the programme. Each week we will ask you to write a post about each thing you have been asked to complete. For your first post write about your experience setting up the blog and tell us a little about what you are hoping to learn from the 23 Things for the Digital Professional programme. Once you have created your blog you can register online to take part in the programme. Blogging Quiz: What type of blogger are you? Meet the Bloggers: Video Case Studies. Blogging about your research: first steps. The author of the blog posts for this week’s theme is Mark Carrigan. Mark is a postgraduate researcher in the Sociology department. He is a prolific blogger and can be found on a number of social networking sites online. 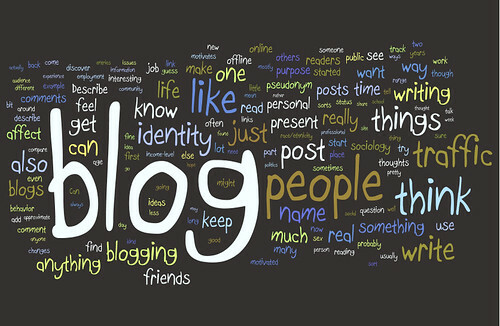 What does the word ‘blog’ mean to you? For many people it has connotations which are far from glamorous. Witness BBC journalist Andrew Marr's dismissal of bloggers at the Cheltenham Literary Festival last year: "A lot of bloggers seem to be socially inadequate, pimpled, single, slightly seedy, bald, cauliflower-nosed young men sitting in their mother's basements and ranting." However in conversations about blogging, the product is often confused with the platform. While many people do use blogs for the sort of sole authored ranting that Marr suggests, this is simply one use of the underlying technology. The platform itself is immensely powerful: zero cost, immediate, easy to use, customizable, collaborative online publishing. The next post will introduce you to thing 1 and your first activity - 'Creating a blog and writing your first post'. From blogging to print: My journey to creating impact. Wikipedia article on the ‘Blogosphere’. Vice-Chancellor, Professor Nigel Thrift’s blog. A Blog of Her Own: Scholarly Women on the Web. Don’t doubt the value of blogging in academic publishing. Cite or Site? The Current view of what constitutes ‘academic publishing’ is too limited.